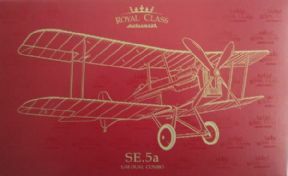 This is Eduard's SE.5A 1/48 Royal Class set and it looks very nice. The set contains 2 plastic kits, allowing you to build both a Viper and Hispano powered SE.5a. It also contains Colour photo etch metal parts, along with wheel and glazing masks and some finely cast resin parts. The set has decals for 13 different SE.5a's including ones flown by the leading British aces, Captains Mannock and McCudden. As a bonus there is also a stainless steel hip flask in the set.